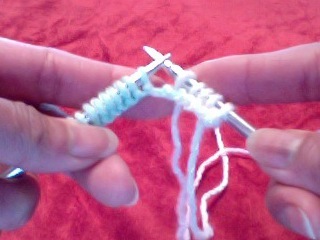 Here are important basic knitting stitches beginning knitters need to learn. Once you learn them, you'll be able to make just about anything with these stitches. See Knitting Terms for more knitting terms and knitting help. 1. Pick your most comfortable Casting on method and cast on 10 stitches or more. 2. 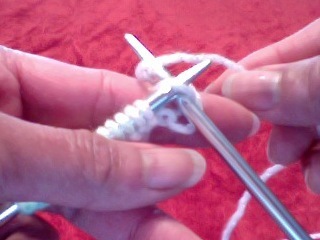 Hold cast on needle with your left hand. 3. With yarn in the back of your work, insert a right-hand needle into the first stitch from front to back of the loop. 4. 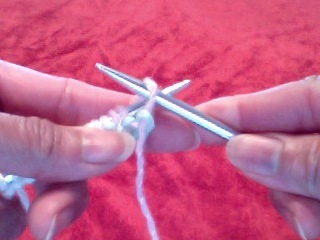 Wrap yarn around the right needle from right to left starting from the back of the needle. 5. 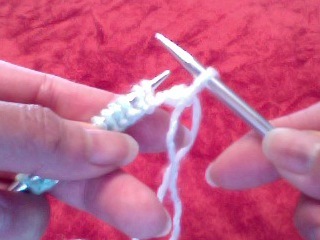 Bring the wrapping yarn forward through the first stitch's loop with the right needle. 6. 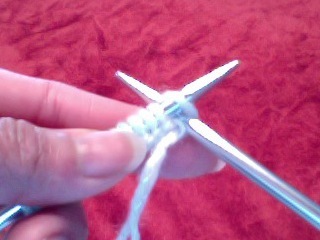 Slowly slide the first stitch off left needle. 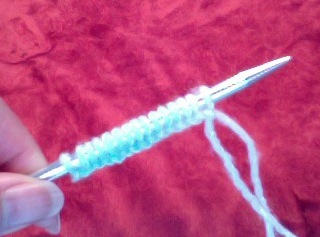 You now have a new knit stitch on the right hand needle. 7. Repeat step 3-6. Something to remember: Always keep your yarn in the back of your work when performing the knit stitch. This exercise will help you increase skills. 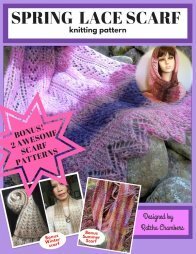 By the time you finish this exercise, you'll become a confident knitter! Garter Stitch Dishcloth - Cast on 40 stitches. 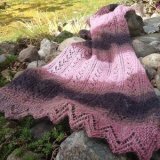 Knit every row until you have a square. Bind off all stitches. Cut off 6 inches of yarn and weave it behind stitches to prevent raveling. You now have a 40 stitches Garter Stitch (knit every row) dishcloth. See Knitting Stitch Patterns for more pattern ideas for dishcloth. 1. Casting on 10 or more stitches. Hold the cast on needle in your left hand. 2. With your yarn in front of the needle, inserting empty right hand needle into the first stitch from the back of the loop to the front of the loop. 3. 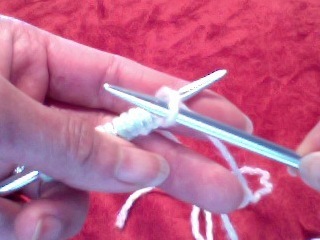 Wrap your yarn around the right hand needle from right to left. 4. Bring the yarn with the needle through the first stitch. 5. 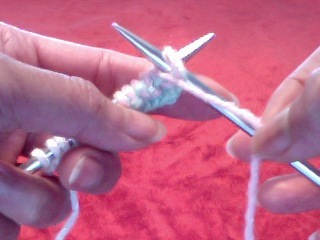 Slide the first stitch off the left hand needle. 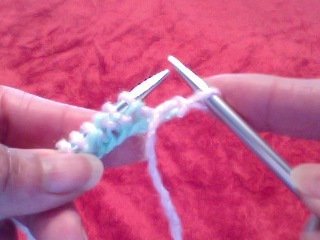 You now have just create a purl stitch on the right needle. 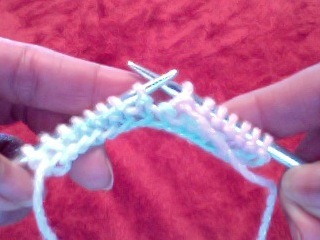 Something to remember : Always keep working yarn in the front of your work when knitting the purl stitch. Knitting Stitches Exercise - Knit and Purl Try this Check Dishcloth exercise to help improve your knit and purl knitting skills. Materials Medium weigh cotton yarn and a pair of number 6 needles. Begin with cast on 48 stitches. to the last 4 stitches; k 4.
to the last 4 stitches, k 4. Row 9 - Same as row 7. Row 10 - Same as row 8. Row 11 - Same as row 7. Row 14 - Same as row 8.
to the last 4 stitches, knit 4.
to the last 4 stitch, knit 4. Row 17 - same as row 15. Row 18 - same as row 16. Row 19 - same as row 15. Row 20 - same as row 16. Row 22 - Same as row 15. Row 23 - Same as row 15. Repeat row 6-23, 2 more times. Then knit 6 more rows. Bind off all stitches. 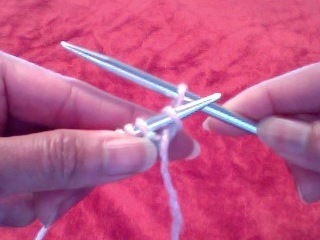 Cut yarn leaving 2-3 inches and weave the excess yarn behind stitches with tapestry needle. Most of the images in this website are edited using Free Online Image Editor. I use it so often to crop, resize and frame my photos. I really like it and thought you might find it helpful.